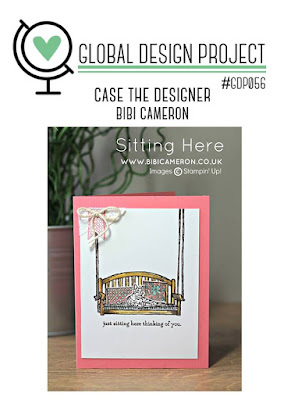 Today I'm playing along with the Global Design Project #GDP056 Case the Designer challenge with Bibi Cameron!! Oh I love Bibi's work! I hope you like what I've come up with! This is an anniversary card for my Mother in Law from my Father in Law & they have a little swing in their backyard, so I thought it was just perfect to make for him to give to her! And I haven't used this stamp set yet... I got it as one of the freebies from OnStage in April earlier this year. It's been sitting on my shelf asking me to use it, I kept taking it down & looking at it, but I wasn't sure what to do with it! I have started with an Island Indigo cardstock base, layered with Blooms & Bliss Designer Series Paper (DSP) & Shimmery White cardstock, which I have heat embossed White & watercoloured. I have stamped everything onto the Shimmery White cardstock with Versamark, after rubbing over with the Embossing Buddy, then dusted with White Emboss Powder & set with the Heat Tool. I have stamped the cat & cushions using the same process on a separate piece of Shimmery White cardstock & then fussy cut them out, so I could layer them up on the seat. I have also entered this card into this week's Crazy Crafters Team Project Hightlights. Click the link to see all the entries & VOTE for your favourites from 7:30pm AEST tonight!